This blog post article is an overview of the skeletal structure (bones) of the low back (lumbar spine) and pelvis. Having a solid foundation in the structure and function of a region allows you to understand and better apply treatment techniques to that region. For more complete coverage of the structure and function of the low back and pelvis, Kinesiology – The Skeletal System and Muscle Function, 3rd ed. (2017, Elsevier) should be consulted. The low back is defined by the lumbar spine, and the pelvis is defined by the bones of the pelvic girdle. 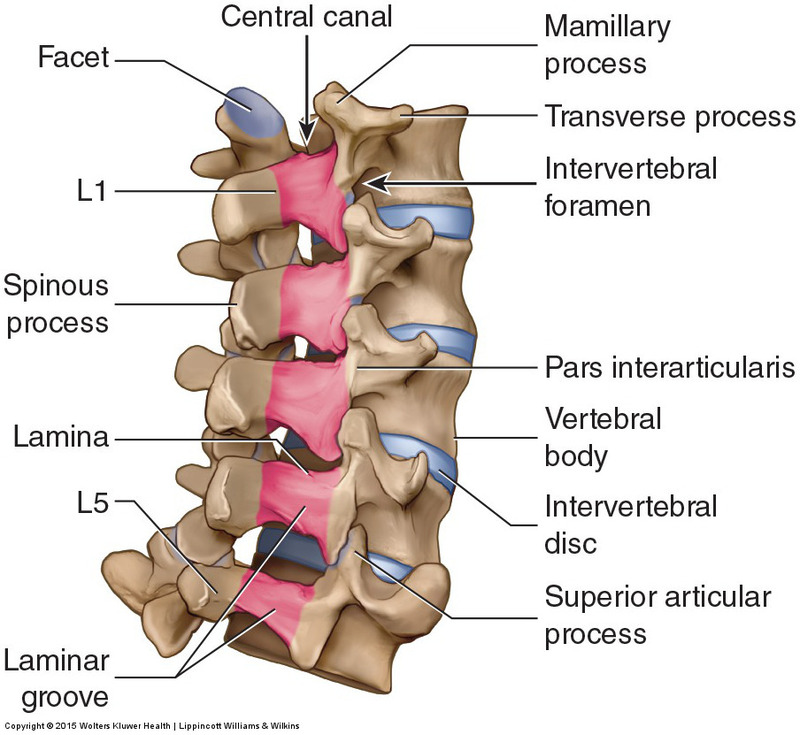 The lumbar spine is composed of five vertebrae, named L1 to L5 from superior to inferior. The pelvis is composed of the two pelvic bones and the sacrum and coccyx (the pelvic bones are also known as the coxal, innominate, or hip bones) (Fig. 1). Figure 1. Posterior view of the lumbar spine and pelvis. 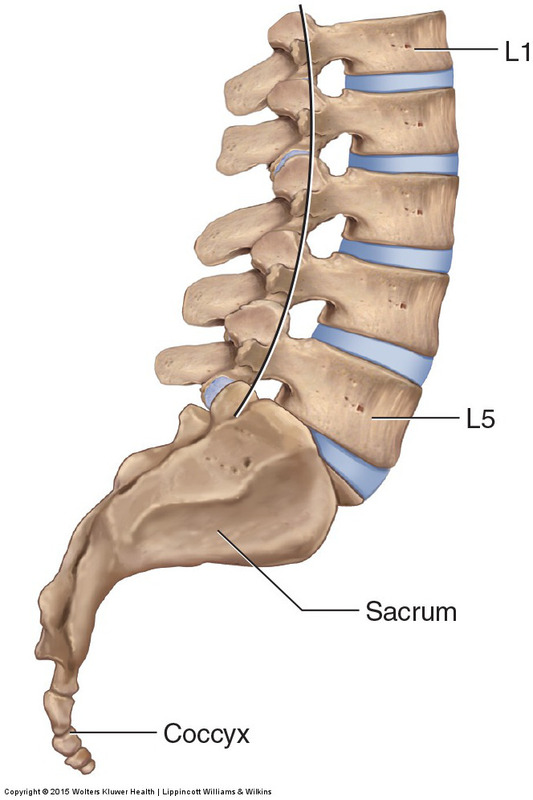 The lumbar spine is composed of five vertebrae, named L1 to L5 from superior to inferior. The pelvis is composed of the two pelvic bones and the sacrum and coccyx. Courtesy Joseph E. Muscolino. Manual Therapy for the Low Back and Pelvis – A Clinical Orthopedic Approach (2015). From a lateral view, the healthy lumbar spine can be seen to have a lordotic curve (lordosis), which is defined as being concave posteriorly and convex anteriorly (Fig. 2). (The terms lordotic and lordosis are often used to denote an excessive and unhealthy lordotic curve. However, these terms are also used to refer to the healthy and normal curve of the low back and neck.) All lumbar vertebrae have a spinous process that extends posteriorly and can usually be palpated. How easy or difficult it is to palpate the lumbar spinous processes depends largely on the degree of the client’s lordotic curve. Because the lumbar curve is lordotic, the spinous processes are recessed and not as superficial for palpation as are the spinous processes of the thoracic spine. However, some clients’ lumbar curves are decreased or even straight; a decreased or absent lordotic curve is termed hypolordotic, making palpation of the spinous processes much easier. If, on the other hand, the client’s lumbar curve is excessive, it is termed hyperlordotic; the spinous processes of a hyperlordotic lumbar spine are more difficult to palpate. Other prominent lumbar bony landmarks are the lamina, laminar groove, mammillary process, transverse process, facets, pars interarticularis, and vertebral body. The spinal cord travels through the central canal formed by the vertebral foramina (singular: foramen), and the lumbar spinal nerves travel through the intervertebral foramina between adjacent vertebrae (Fig. 3). Figure 2. Right lateral view of the lumbar spine. The lumbar spine’s curve is described as lordotic, with its concavity facing posteriorly and its convexity facing anteriorly. Courtesy Joseph E. Muscolino. Manual Therapy for the Low Back and Pelvis – A Clinical Orthopedic Approach (2015). Figure 3. Right posterolateral view of the lumbar spine. Prominent bony landmarks are labeled. Courtesy Joseph E. Muscolino. Manual Therapy for the Low Back and Pelvis – A Clinical Orthopedic Approach (2015). Because of the lordotic curve and the thick musculature that overlies the lumbar spine, the only easily palpable bony landmark is the spinous process. Therefore, the spinous processes (and laminae) are used when contacting the lumbar spine for motion palpation assessment and joint mobilization treatment. The bones of the pelvic girdle are the two pelvic bones and the sacrum and coccyx (see Fig. 1). Each pelvic bone is composed of three bones—the ilium, ischium, and pubis—that fuse together embryologically (Fig. 4). The sacrum is composed of five vertebrae that did not fully form and fused together to create a triangular-shaped bone. The triangular-shaped sacrum is upside down, with the sacral base located superiorly and the apex located inferiorly. 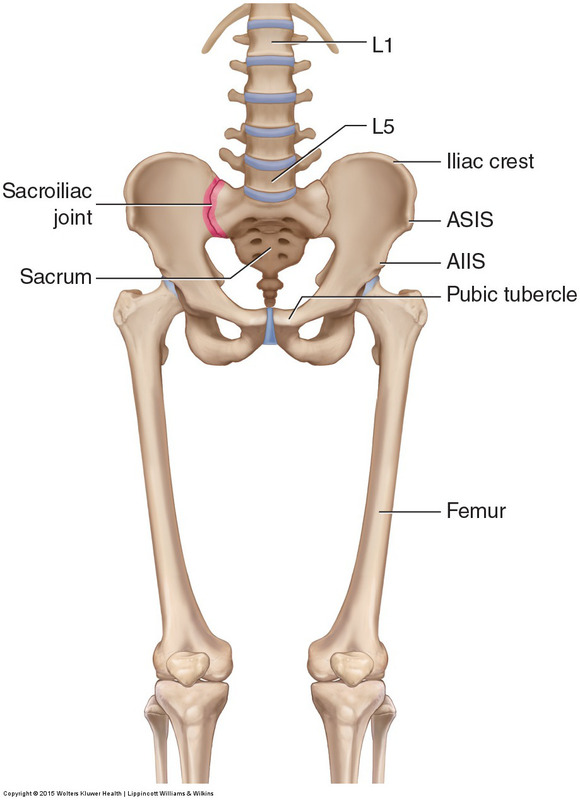 Between the sacrum and iliac portion of the pelvic bone on each side of the body is a sacroiliac joint (SIJ). 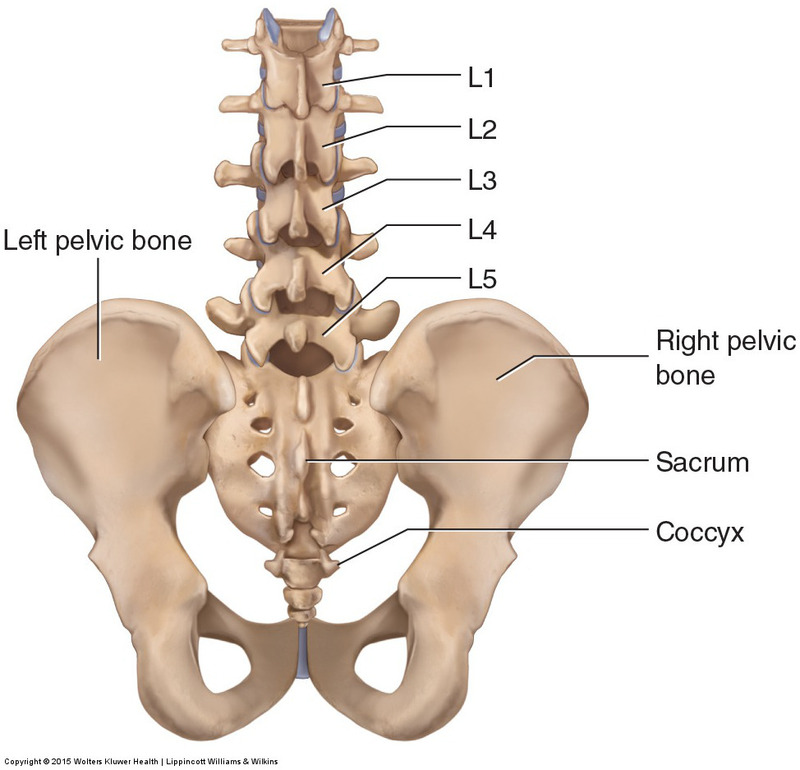 The coccyx, usually considered to be the evolutionary remnant of a tail, is composed of four poorly formed vertebral segments that often fuse as a person ages. There are a number of important bony landmarks of the pelvis. On the posterior side are the posterior superior iliac spine (PSIS), posterior inferior iliac spine (PIIS), greater sciatic notch, ischial tuberosity, ischial spine, and sacral tubercles (Fig. 5A). A dimple in the skin of the client can usually be seen where the skin falls in on the medial side of the PSIS (Fig. 5B). Locating this dimple is helpful when palpating for the PSIS. On the anterior side are the anterior superior iliac spine (ASIS), anterior inferior iliac spine (AIIS), and pubic tubercle (Fig. 6). The iliac crest is located laterally between the PSIS and ASIS (see Figs. 5A and 6). The PSIS and ASIS are easily palpable and important contacts for stabilization of the pelvis when stretching the client. 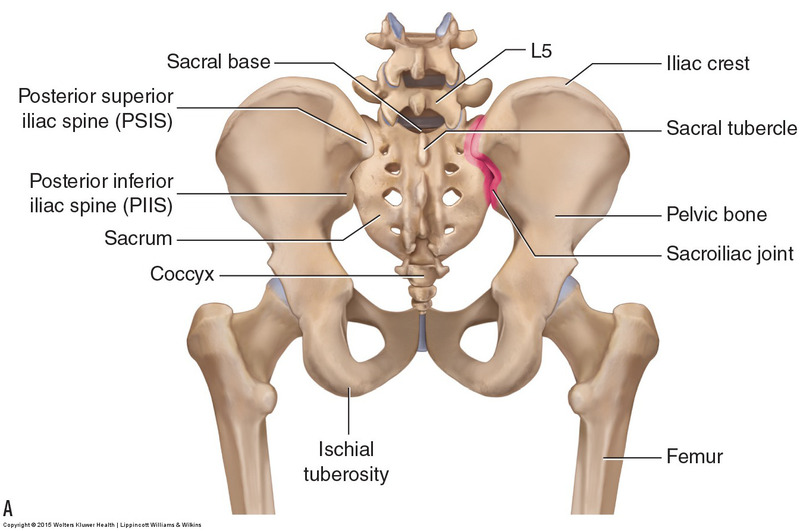 The PSIS and sacral tubercles are also important when performing motion palpation assessment of the SIJs of the pelvis, and the PSIS is an important contact point when mobilizing the SIJ. Figure 4. Lateral view of the right pelvic bone. 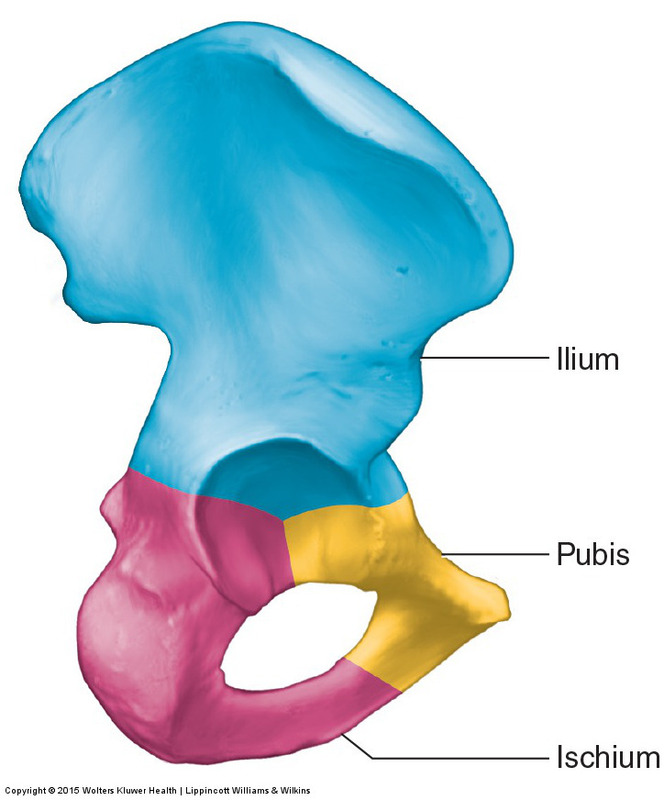 The ilium, ischium, and pubis have been colored to discern their borders: The ilium is blue, the ischium is pink, and the pubis is yellow. Courtesy Joseph E. Muscolino. Manual Therapy for the Low Back and Pelvis – A Clinical Orthopedic Approach (2015). Figure 5. Posterior views of the lumbar spine and pelvis. (A) View of bones and bony landmarks. (B) Dimples are usually visible immediately medial to the PSISs. Courtesy Joseph E. Muscolino. Manual Therapy for the Low Back and Pelvis – A Clinical Orthopedic Approach (2015). Figure 6. Anterior view of the lumbar spine and pelvis. The prominent bones and bony landmarks have been labeled. AIIS, anterior inferior iliac spine; ASIS, anterior superior iliac spine. Courtesy Joseph E. Muscolino. Manual Therapy for the Low Back and Pelvis – A Clinical Orthopedic Approach (2015). Note: This is the first in a series of 8 blog post articles on the anatomy and physiology of the lumbar spine and pelvis. This series of blog posts will present a review of the essential anatomy and physiology of the low back and pelvis. The lumbar spine is composed of five vertebrae. Landmarks of the lumbar spine that are particularly important for stretching and joint mobilization techniques are the spinous processes and laminae. Each lumbar spinal joint level has two paired facet joints and a disc joint. The lumbar spine moves very well in all ranges of motion except rotation. Structurally, the musculature of the low back can be divided into four quadrants: anterior right, anterior left, posterior right, and posterior left. Functionally, the muscles of the low back can be divided into six major mover groups: flexors, extensors, right and left lateral flexors, and right and left rotators. Structurally, the muscles of the pelvis can be divided into three categories: muscles crossing the lumbosacral joint from the trunk onto the pelvis, muscles crossing the hip joint from the lower extremity onto the pelvis, and pelvic floor muscles. As with the muscles of the trunk, pelvic muscles that cross the hip joint can also be divided into four quadrants: anterior, posterior, lateral, and medial. Functionally, these muscles are usually considered from their open chain action on the thigh. However, their closed chain action on the pelvis is likely more important; certainly, it is with regard to their effect on the posture of the pelvis and therefore the lumbar spine.